Will Congress end mass incarceration? The proposed bill will only have a modest effect. How Much Will Congress Really Reduce the Prison Population? When you crunch the numbers, the effect of the proposed law looks mighty modest. 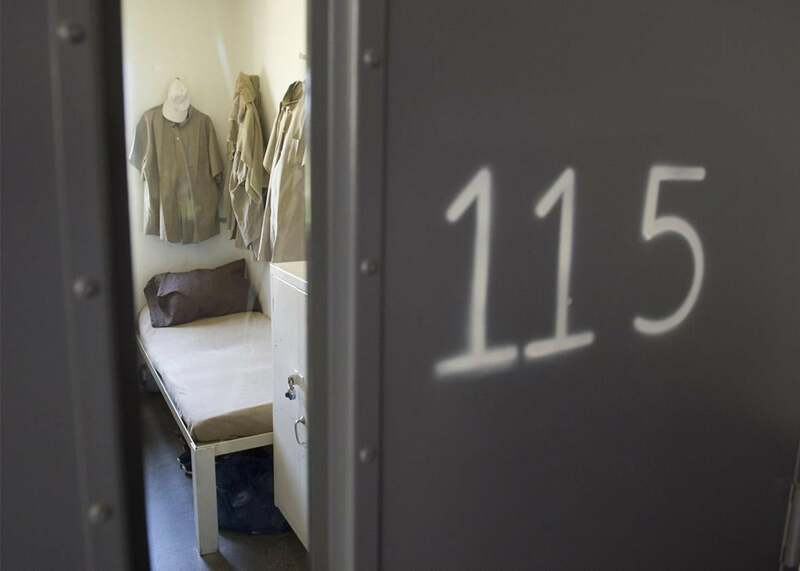 A prison cell at the El Reno Federal Correctional Institution in El Reno, Oklahoma, on July 16, 2015. Last week, a criminal justice reform bill centered on reducing sentences for some federal prisoners came one step closer to becoming law, with the Senate Judiciary Committee voting 15–5 to move the bill to the Senate floor. While there are still reasons to be skeptical that the House will act quickly enough on its version of the bill for any actual legislation to be passed, it’s worth looking at the impact the law would have if it passed. To that end, researchers at the Urban Institute, a Washington-based think tank, have developed a handy interactive calculator that lets you predict how much the federal prison population—which has ballooned from 71,608 in 1991 to 205,511 today—would drop over the next eight years given various policy changes. While the calculator is not equipped to take into account the particulars of the legislation under discussion in Congress, it underscores the important fact that roughly one-half of the federal prison population is made up of drug offenders. It also shows just how modestly the federal system’s size would be affected if the kinds of changes being proposed in Congress are the only ones that end up becoming law. As Urban Institute researcher Brian Elderbroom explained to me, the calculator distinguishes between two types of reforms: ones that reduce the number of people who enter prison, and ones that reduce the amount of time that people spend there. The sentencing reform bills in Congress—which are focused on making mandatory minimums for federal drug offenders less harsh, and applicable to fewer prisoners—only include the latter type. The Urban Institute calculator, which lets you see the result of reducing length of stay by 5, 15, 25, or 50 percent, shows the discouraging limits of the proposed legislation. According to the calculator, even if all federal inmates locked up for drug trafficking see their prison sentences slashed by 50 percent, the overall prison population would be reduced by just 18 percent by September 2023, relative to where it would be if sentencing laws stayed the way they are. This would be nothing to sneeze at, of course—18 percent of the federal prison population is more than 36,000 people—but Elderbroom points out that a 50 percent reduction in sentence length for drug traffickers is “way, way more” than what the proposed legislation would actually achieve. So what would make a more significant difference? A combination of reforms that reduced length of stay and reduced the number of people being admitted to federal prison in the first place. That would involve embracing elements of an ambitious congressional bill called the SAFE Justice Act, which was introduced earlier this year in the House but is pretty much dead in the water now that the sentencing reform bills in the Senate and the House have found momentum. The SAFE Justice Act, Elderbroom said, included a number of reforms that promised to cut admissions, such as eliminating federal criminal penalties for simple drug possession in state jurisdictions; making probation presumptive for first-time, non-violent offenders; and expanding the use of so-called problem solving courts, which divert people who have been convicted of some crimes into treatment. You can play with the Urban Institute’s federal prison population forecaster here, and check out an earlier tool, which addresses the impact of state-level reforms, here.